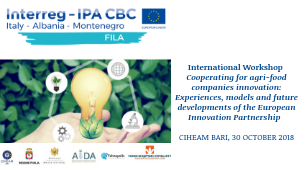 On the agenda of CIHEAM Bari, on 30 October, the International Workshop Cooperating for agri-food companies innovation: Experiences, models and future developments of the European Partnership for Innovation - Operational Groups (OGs). This initiative is part of the activities of the FILA Project (Strengthening and empowering of cross-border innovation networks through Fertilization Innovation Labs in Agro-food for improving the connection between research and SMEs (EIP approach), funded under the Interreg IPA CBC cross-border programme Italy-Albania-Montenegro and set up with the aim of strengthening cooperation in the lower Adriatic Sea area and facilitating the exchange of knowledge between regional and local stakeholders of the three countries. The objective of FILA is to create a Regional Network involving the operational groups and to stimulate sharing of ideas at international level in order to promote innovation and competitiveness of agri-food companies, and, above all, youth employment. The meeting will be opened on Tuesday 30 October, at 9.30 am, by Maurizio Raeli, Director of CIHEAM Bari, Gianluca Nardone, Director of the Agriculture, Rural and Environmental Development Department of Puglia Region, Aurora Maria Losacco, Project Officer-Joint Secretariat of the Interreg IPA programme Italy-Albania-Montenegro. The results achieved so far, the experiences and the future developments of the OGs and their relevant regional , cross-border and international networks will be discussed by the representatives of EIP- AGRI (European Innovation Partnership for Agricultural productivity and Sustainability) Network of the European Commission (DG Agriculture and Rural Development), SCAR (Standing Committee on Agricultural Research), University of Bari, Puglia Region, CIHEAM Bari, RRN (National Rural Network), Ministries of Agriculture and Economic Development of Albania and Montenegro, Arti Puglia (Regional Agency for Technology and Innovation), ENEA (National Agency for New Technologies, Energy and Sustainable Economic Development), Copa Cogeca, FIDAF(Italian Federation of Agricultural and Forestry scientists). The meeting will be moderated by Angelo Di Mambro, journalist at ANSA, and the closing remarks will be delivered by Alessandra Pesce, Undersecretary of the Italian Ministry of Agriculture, Food and Forestry Policies for Research and Innovation. The Fila Project is led by CIHEAM Bari in partnership with Puglia Region - Agriculture, Rural and Environmental Development Department, the Albanian Regional Development Agency n. 3 (Korce, Elbasan, Berat), the AIDA (Albanian Investment Development Agency), the Innovation and entrepreneurship centre Tehnopolis (Montenegro) and the Ministry for Business Development of Montenegro.